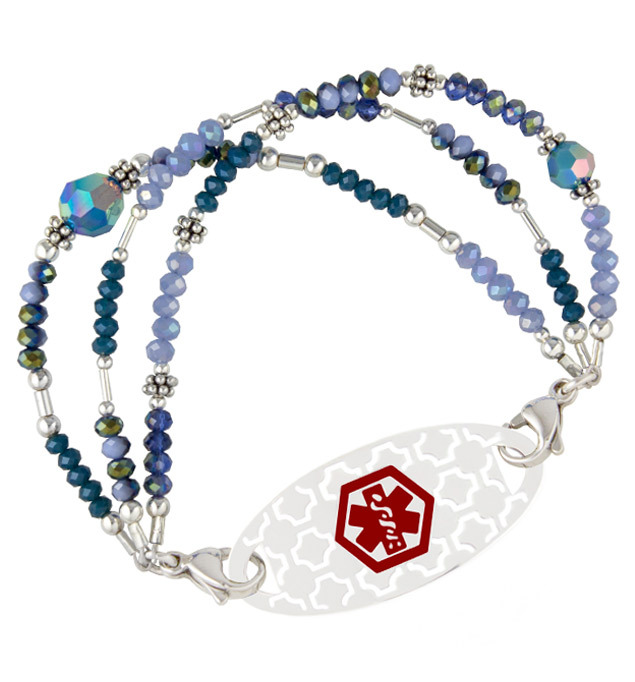 Caribbean blue opals and turkish blue crystals blend with sterling silver and faceted crystals in an array of blues to create our Santorini Medical ID Bracelet. Named for the famously brilliant blue waters around the island of Santorini in Greece, this three-strand design pairs with any Lauren’s Hope custom-engraved medical ID tag. A Lauren’s Hope Signature Style, the Santorini Medical ID Bracelet is hand-crafted in our Kansas City studios. As with all of our interchangeable designs, you can wear your Santorini Medical ID Bracelet with any custom-engraved Lauren’s Hope medical ID tag, keeping what’s truly most important to you right at hand. This on-trend med ID is a great choice whether you wear your medical alert bracelet for epilepsy, lupus, hypothyroidism, Alzheimer’s, vision impairment, or any other medical condition or treatment consideration. Custom engraving allows you to choose the look you want so you can stay safe in style.